RF modules need a corresponding remote controller to work together. Make sure the receiver and the remote control address are consistent before using. The following example is based on our Metal Remote Wireless Keyfob. 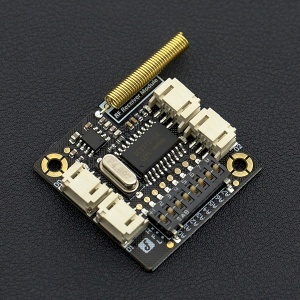 315MHZ RF Receiver module has 8-bit three-state address coding switch (a0~a7), each one has three states: high level, low level, floating empty, up to 6,561 address make your device more security. Note: the default address of controller is floating empty (middle position). This module can be used with SC2260, SC2262, PT2260, PT2262 and other coding chips. Please click here for the Address Setting. 1.The address code must be consistent. SC2272-L4 is a latch decoder, the LED will light on when it receive corrsponding signal. In this tutorial, we use Arduino UNO to read the GPIO output. The light will be on until you press the other button. 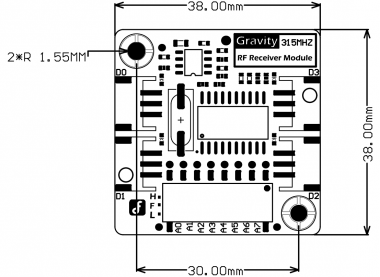 Get Gravity: 315MHZ RF Receiver Module from DFRobot Store or DFRobot Distributor.